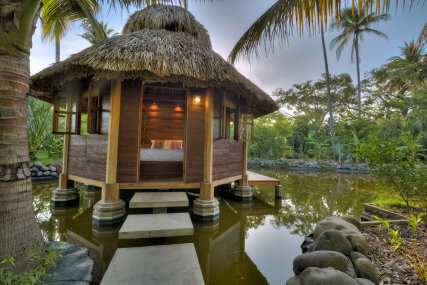 The property has a riverfront and beachfront, where a cobblestone point creates ideal waves for surfing and fishing. The two acres are split into two zones, north and south. The southern half is where Mandala Eco Villas is located. The north half is our designated for our food production. Although the property itself is a food forest; bearing coconuts, mangos, bananas, almonds and edible annual and perennial herbs, the north property is used as a bio to intensive organic farm to provide as much fresh veggies and herbs for our guests’ well to being. The property has an artificial pond home to various species of local fish, shrimp, turtles and birds. This pond will also serve as a source of nutrients and minerals for our upcoming hydroponic systems. Mandala’s layout was intended to follow the basic geometrical principles found throughout nature, resulting in a natural flow of energy that complements our surroundings and place creating natural flow and resonance. 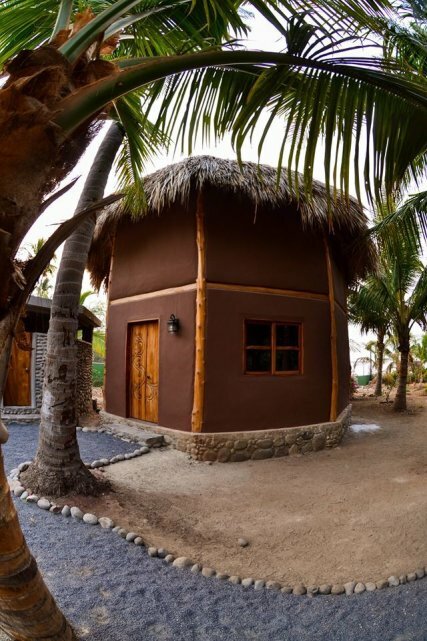 Our eco to villas were designed and built to minimize the use of non renewable natural materials, and increase the use of locally sourced or reclaimed wood. All the wood was milled locally by craftsman of the area. Playa El Cocal is located at the km 37 of the Litoral road, right next to the city of La Libertad. In this area you find private residentials, quiet environment, a couple hotels and hostels and beach houses available for rent. This area is separated by the river, making the east side known as Cocal or Recodo and the next side at the west known as San Blas Beach, both very different, Cocal is sandy just in summers, the rest of the year in the rain season is rocky. San Blas is one of the only sandy beaches that keep the sand during the rainy season in La Libertad area. The river mouth is what it make the amazing spot of Cocal, the side of Cocal where you will find more rocks is the main right hand point break, in the other side of San Blas. IVA Tax are included in the price. Our cabins were built to maximize natural air flow from all directions. Built over stilts, air flows freely over, under and through our cabins. The result is a lack of need for air conditioning, resulting in a deeper and more relaxing sleep. They stay fresh during the hottest days due to the design and construction. 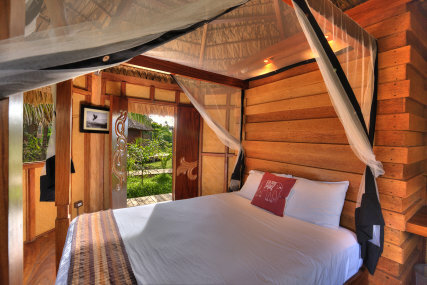 Mandala Eco Villas consist of 5 rooms; 4 eco suite villas ideal for singles or couples, and one family room which sleeps 5+ comfortably. Each room is equipped with a hypo to allergenic natural latex Queen size mattress, desk, and outside shower. Each room was designed with comfort and airflow in mind. 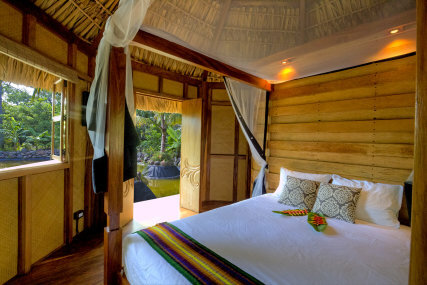 Building built of 100% local and renewable materials, the rooms push the realms of ecological hotels to another level.The eco to villas are built with local renewable hardwoods and up to cycled pallet wood, while the family room is an earthen home, made entirely of straw, sand, clay and wood. We provide Airport Transfers from and to San Salvador and they can be booked in the booking steps. 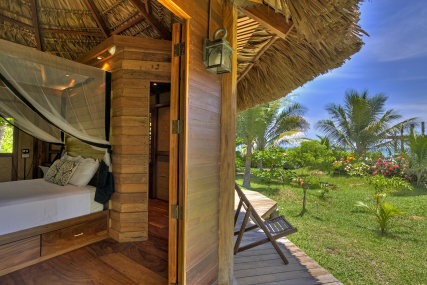 My name is Arnie; co to founder and manager at Mandala Eco Villas. Passionate about surfing, fishing, permaculture and good living. It will be a pleasure to host you!